When it comes to dancing and confidence, men over 65 years estimat their dance performance higher. In women, it does not apply. After 35 years, they feel less confident on the dance floor. Conclude British psychologists. Psychologist Peter Lovatt, at the University of Hertfordshire, compared the dance style with the self confidence of 14,000 Britons. While young girls exude confidence when dancing, is that to boys not the case. Boys are less confident about their way of dancing. Only after their sixteenth the dance embarrassment seems to be decreasing. They reach their peak after their 65 th birthday. 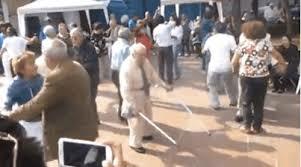 Older men find their dance style than even much better than their younger gender peers. It is different with the ladies. It works the other way with them. While they younger dance with full confidence, is that after the 35 th year of life no longer the case. The older they get, the less they like their dance performance. ... and a nice reaction: My hypothesis is that older men do better because they have less to prove and care about what others would think, while women with age fear they look less good and therefore prefer to keep a low lying profile. Or because older men meanwhile have learned to dance.